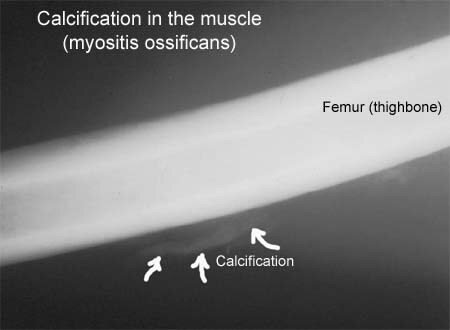 Muscles which have been subjected to a rupture can from time to time be found to have some calcification, although the reasons for this are unknown. The diagnosis is often made due to the rehabilitation not progressing as expected in relation to the primary evaluation of the extent of the injury. 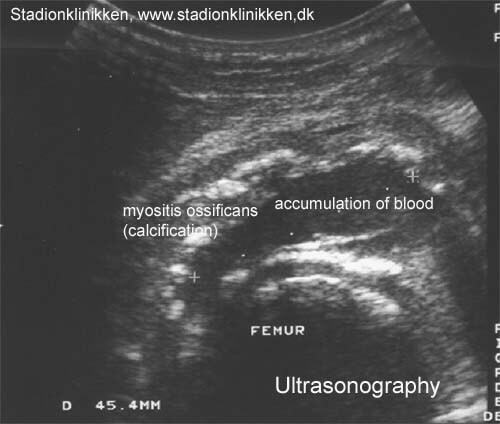 The calcification can be seen under ultrasound scanning after a few days, and subsequently on an x-ray after a few weeks (X-ray picture), (Ultrasonic image) . The treatment comprises relief, and if possible, ultrasound-guided draining of the blood accumulation, ultrasound-guided injection of corticosteroid and rheumatic medicine (NSAID). A considerably longer rehabilitation period must be expected if the muscular bleeding is complicated by calcification in the muscle. Surgery is almost never indicated, as an operation can involve further calcification. Vigorous massage on the blood accumulation should be avoided on the same grounds (article-1), (article-2). Formation of scar tissue in the muscles (cicatricial tissue). Formation of scar tissue is often seen after a muscle rupture, and can in some cases cause permanent discomfort. The formation of scar tissue is often the cause of the rehabilitation progressing slower than anticipated, as well as relapses a long time after the injury initially occurring. A local tenderness in the muscle can usually be experienced, aggravated when activating and stretching the muscle. It is often possible to detect scar tissue under ultrasound scanning, however, this can be quite difficult and requires a doctor well experienced in performing ultrasound scans. An area of inflammation will often be seen surrounding the scar tissue formation. The treatment comprises further relief, possibly supplemented by rheumatic medicine (NSAID) or ultrasound-guided injection of corticosteroid, (article). Blood accumulation in the muscle (haematoma musculi). Injuries to muscles always involve muscular bleeding to a greater or lesser extent. In some cases the bleeding is diffuse between the muscle cells, whereas other cases can involve the bleeding being a larger, well-defined accumulation in the muscle. The larger the accumulation, the longer period is required for the accumulation to disappear and allow the muscle to heal. Accumulations of blood in the muscles often entail more pronounced pain than anticipated in relation to the primary evaluation of the extent of the injury. The diagnosis is best made via use of ultrasound scanning. If the accumulation is large it can be drained, which can advantageously be performed under guidance of ultrasound. Some recommend treatment with rheumatic medicine (NSAID) and advise caution regarding massage to reduce the risk of myositis ossificans. Formation of fluid in the muscle (Hygrom). A formation of fluid will sometimes appear after an injury to a muscle, and can be of a considerable size. If the fluid does not diminish following relief, the accumulation can be drained by use of ultrasound scanning, with injection of corticosteroid being a further possibility. Fluid accumulations can be the cause of the rehabilitation not progressing smoothly. The groups of muscles on the arms and legs are surrounded by taught muscle membranes (fascias), which are partially unremitting. Damage to blood vessels and nerves can be caused if the bleeding and fluid accumulation in the muscles reaches such a size that the pressure in the muscle group increases. Serious damage to muscles can be caused in acute cases which result in the blood vessels closing. The symptoms comprise increasing pain in the damaged arm or leg muscle, which is often more powerful than expected from the primary evaluation of the extent of the injury. At the same time sensory disturbances can occur. The diagnosis is made by performing a pressure measurement in the muscle compartment, (article). The treatment comprises acute severing of the muscle membrane. It is imperative for the continuing function of the muscle that this operation will be acute, which is, of course, only possible if the athlete seeks acute medical attention, (article-1), (article-2), (article-3). The groups of muscles on the arms and legs are surrounded by taught muscle membranes (fascias), which are partially unremitting. Pain can be experienced in a muscle group in the leg after only a few minutes activity following an earlier muscle injury, or following a very rapid increase in training of individual muscle groups. There is a sensation that the muscle is “tightened” and becomes hard, which is accompanied by discomfort. If the activity is stopped the discomfort diminishes, but returns a short period after the resumption of sports activity. This can be due to the muscle swelling up (after injury), or growing quicker than the muscle membrane can manage to keep up to (increase in training intensity too fast), whereby the pressure on the blood vessels and nerves in the muscle group increases. The diagnosis can be made with a pressure measurement in the muscle compartment, (article). Treatment comprises relief with slowly increasing training intensity after loss of symptoms, rheumatic medicine (NSAID). If there is scar tissue in the muscle, ultrasound guided injection of corticosteroid around the scar tissue formation can be attempted. In cases where there is a lack of progress a surgical severing of the muscle membranes can be performed, which is usually a minor procedure with good results. (article-1), (article-2).